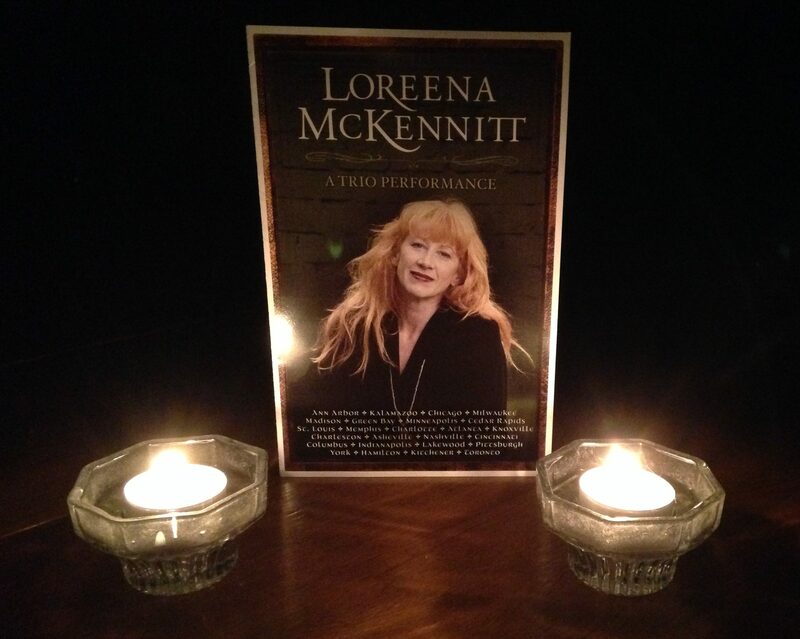 Editor’s Note: My husband Brian writes his third post for The Stratton Setlist about the Oct. 12 Loreena McKennitt show at the Michigan Theater in Ann Arbor, Mich.
On Christmas morning in 1994, I opened a gift from my parents that had the unmistakable shape of a CD. As I tore off the wrapping paper, revealing the cover, I was greeted by a woman with a harp, wearing vaguely antiquated clothing, standing on a hill overlooking a lake. It turned out to be “Parallel Dreams” by Loreena McKennitt, an album by an artist I had never heard of. My dad had heard about Loreena McKennitt on public radio driving home from work one night. He knew that I was interested in Enya and other Celtic and New Age music, so he thought I’d be interested in her as well. After looking at the hazy album art, I turned the CD over and read through the song titles – “Samain Night,” “Standing Stones,” and “Ancient Pines” among others. They certainly sounded interesting. I proceeded to open the CD and, below a pastoral, woodcut scene, saw an introduction written by Loreena McKennitt herself. She was describing how dreams are “a vehicle through which we have integrated our conscious and subconscious, the real and the surreal, the powerful and the intangible.” Then she went on to introduce the different songs as our own “parallel dreams.” If I was interested before, I was intrigued now. Playing the album I was instantly transported to a different time and place. It was no longer Christmas morning, but it was Samain night, the Celtic holiday that would eventually become our modern day Halloween. The music of the harp and cello revealed an older side of the holiday, one of wonder and mysticism, rather than one of garish horrors, which we associate it with today. This was the beginning of my journey with McKennitt, an analogy which she often uses to describe her music. From Samain Night I would go on to visit Dublin in the time of Dickens and standing stones on the Orkney Isles. Her other albums would expand these journeys, to caravans in the Middle East or to the gates of Istanbul. I would delight as she put the words of poets, such as Yeats, Tennyson, St. John of the Cross and Shakespeare to music. Yet always the sense of wonder pervades her songs, and a pondering of the deeper mysteries of life. By exploring these other times and places, you feel that you gain a deeper understanding of humanity and our place in the world. I was very glad that I began that journey back in 1994. Now I was at another stop on that journey, and it felt remarkably like the beginning. I saw Loreena McKennitt in concert on October 12 at the Michigan Theater in Ann Arbor, and accompanying me was my dad. We were in the Michigan Theater, an elegant setting for her music, both of which invoke the spirit of a bygone age. She opened the show with “Samain Night”, the first song I had ever heard of hers. She followed the song with “All Souls Night”, and it felt perfect for this time of year. McKennitt would go on to play for over 2 hours, moving between the harp and piano on the candlelit stage. She was joined by cellist Caroline Lavelle and guitarist Brian Hughes for a trio performance. Between the pieces she talked about how the songs were a travelogue of her journeys to Ireland and elsewhere. I was happy to be on a journey of my own that night, with my dad. It started with a gift on Christmas morning in 1994 and it is still going on now. I’m excited to see where the journey goes next.